Facing increasing global competition and the demand for lower pricing, TK Mold & Engineering of Romeo, Mich., sought new technology that could help it apply a production mindset to its automotive mold manufacturing operations. TK Mold wanted to produce its high-quality molds cost-effectively and with repeatability. The company needed additional capacity to accomplish this goal. With recommendations from Single Source Technologies (SST), TK Mold invested in an a61nx horizontal machining center and an FCS modular work-holding system that would require less time spent in setups and more time machining. 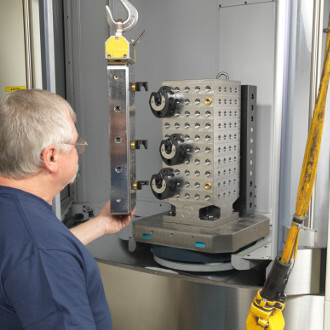 The machines replaced the company’s previous commodity vertical machining centers, so operators were trained on how to run the a61nx in order to employ production practices in its mold manufacturing. With its new equipment, TK Mold has seen a 60 percent reduction in handwork and spotting on its molds. EDM processing has been reduced or eliminated in several applications, saving additional time. On the a61nx, TK Mold operators set up the next pallet outside of the machine while the current job is being processed. The FCS system can be used on mold blocks of any size, and setups that once took hours now take a matter of minutes. The company uses the FCS system with other machining centers on its shop floor, saving time in those areas as well. With this equipment, TK Mold has been able to adopt more of a production mentality. Processes that used to take three machines to accomplish can be completed on one machine with lower labor cost and shorter setup times. Lead-times have improved, and TK Mold is able to produce more custom molds than it could before. With its additional mold manufacturing capacity, it was able to match its total 2014 revenue in just the first six months of 2015. The company expects to keep doubling revenue each year as the result of its advanced technology.